Remember that old business slogan, “The customer is always right?” I disagree. Although it has been few and far between, I have had encounters with patients who expressed their disappointment with my services. It probably is one of the hardest things I have gone through as a practitioner; after all, I set up shop to help people. And then there is the Internet where people can take their expressions and say anything they want, hurtful as it may be. But here is the rub, in most incidences, their account of our interaction or their experience was nowhere near my perception of it. This is why I am not able to sign on to the commanding rule of the customer, or in this case, the patient always being right. This was an important lesson for me to learn in these instances and keep applying to my practice, because it is true. I work with people, people in need. As humans, our preconceptions and projections, who we are, and our previous experiences can dramatically affect the way we perceive the world. There is a saying attributed to the prominent writer Anaïs Nin that reflects this idea: “We don’t see things as they are; we see them as we are.” As hard as it is to feel like I have let someone down, my wisdom has allowed me to deem that the patient is not always right, but they do have the right to be heard. 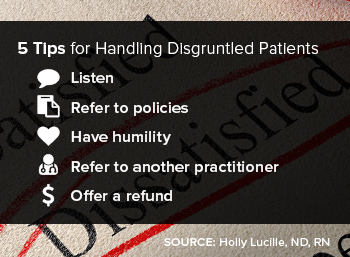 Here are a few ways I have learned to handle disgruntled patients. No, really. With your ears, and not your mouth. Really lean in and let this person be heard. Being on the defense is the last thing you want. They might not be right, but really listening and honoring their experience keeps the therapeutic relationship in tact. Office policies are something I revise almost every month. They serve as a container for my practice and give a heads up to what someone can expect from working with me. I have each and every patient read and sign a policy document so I know from the beginning we are on the same page. They know my heartfelt intention and boundaries going in and I can remind them of that. Every situation we are involved in can be used as an opportunity to learn and grow. Being able to take a less than ideal situation, take responsibility for it, and examine the situation in a way where you ask yourself questions and grow is important. When these situations arise consider asking yourself what you can learn from the situation at hand, where could you have contributed to the end result, and what you will do differently in the future. Listening, honoring, and acknowledging your patients experience along with offering a referral to another practitioner in the area can emphasize your continued care for the individual. It may be, that your relationship wasn’t meant to be, and the best thing you can do to help them, is find them someone who they can work with more effectively. I had a situation once where after an initial visit with a woman, her husband became involved in the communication, emailing me incessantly and calling my office. I had permission to speak to him from my patient but his demeanor and communication were disruptive, argumentative, and violating my office policies. When I brought this up to my patient, she felt like I wasn’t honoring her husband’s support, the situation seemed to escalate, and I had no sense that this would change. In this case, I offered a full refund for my services if she wanted to go forth and find a doctor that had the capacity to handle their needs. It was worth my time and money to manage the situation this way.